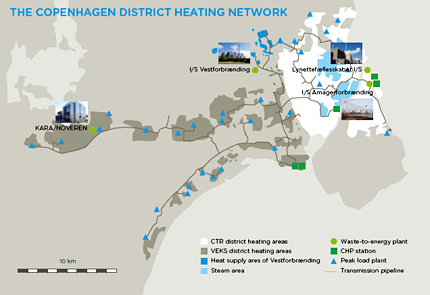 Copenhagen's district heating network combines 160km of primary pipes and 1,500km of distribution pipes with 10 main combined heat and power (CHP) stations, three heat storage installations, pumping stations and peak load plants to form the largest such system in the world. It supplies 98% of the city's heat needs. In addition, Denmark's first district cooling network opened in central Copenhagen in 2010. The heating network covers the city centre and 15 suburban districts. At the moment, cooling is only supplied to the city centre. Citizens own both systems, either directly through co-operatives or indirectly via municipal companies. The Danish government is responsible for overall energy policy, legislation, tax regimes and subsidies, while the local municipalities are responsible for heat planning, project implementation and connections to the network, which are now compulsory (electric heating in buildings is not allowed). see it larger and read its key. Diagram courtesy Rambøll. There are two main district heating networks. One is run by Central Kommunernes Transmissionsselskab (CTR), otherwise known as the Metropolitan Copenhagen District Heating Company. The other is run by Vestegnens Kraftvarmeselskab (VEKS). Denmark is a market leader in the design of pipes for district heating. The steel twin-bore pipes have plastic — or sometimes steel or concrete — casings and are packed with insulation and buried in drained soil. The 160km-long Copenhagen primary network carries hot water or steam to the city's distribution network through 250-800mm diameter pipes, which even run beneath Copenhagen Harbour in a purpose-built tunnel. The 1,500km small-diameter distribution network combines 1,370km of hot water and 130km of steam twin-bore pipes. Hot water is delivered at 115 deg C to each building, where it is used to heat the building's own water-based central heating system via heat exchangers. Doing this cools the district heating water down (to 55 deg C) and it returns through the network for re-heating and re-circulation. It doesn't mix with the water flowing through building systems. For Copenhageners, hot water 'on tap' is completely normal. There are heat (energy) meters at the point of heat supply to a building, and if there are multiple users, heat allocators can be attached to radiators to record how much heat each device uses. There are also water (flow) meters. Citizens pay for heat in the same way they pay for other metered utilities like water or electricity. At the moment, Copenhagen Energy reads domestic meters every second year, with customers doing it in between. A three-tier tariff applies based on capacity (20-25%), heat consumption (75-80%) and cooling (for low return temperatures, not district cooling, which is separate). Prices are usually the same across the city, and a typical home costs around 11,350 Kroner (including taxes) to heat for a year — half of the cost of oil-fired heating. Remote meter reading is being introduced, and a pilot project is underway. Data recorded includes energy consumption, flow and temperatures. It's hoped that this will be useful for implementing energy saving initiatives. Probably the best incentive is people being able to see how much energy (and water) they use and self-regulating accordingly. Danish heat and water taxes are high. Localised steam supply started in Frederiksberg, Copenhagen, in 1903 with a service supporting the city's hospitals, based on waste incineration. Buildings close to the hospitals were gradually connected to the early system — the start of Copenhagen's district heating is usually stated as 1925. Although hot water district heating now supplies most of the city, steam is still supplied to major city-centre customers and covers 25% of Copenhagen's heat demand. Expansion of the steam network ceased in 1980 and work has begun to convert it to hot water. Conversion is planned to be completed by 2025. Driving this move is the better distribution efficiency of the hot water system, the higher efficiency of CHP plants producing hot water and the decrease in CO2 emissions achievable by making the change. Copenhagen's — and Denmark's — first district cooling plant opened on 10th June 2010 in Adelgade in the city centre near the Rosenborg Gardens. It supplies cold to major local customers in place of individual air conditioning installations. Another plant near City Hall should be operational by 2012-13. The Adelgade plant is located inside the country's first electricity generating station, which dates from 1892 but has been idle since the 1970s. The plant uses two kinds of absorption chillers to convert waste heat or wind power to cold. It also makes good use of the power station's original cooling pipes, which connect to Copenhagen Harbour and bring seawater for additional cooling. The pipes are almost 1m in diameter and lie 6m underground. "... they thought we were crazy." "The ... concept is commonly accepted by the population, not least because it underpins the political tradition to create incentives that would benefit the society and pave the way for collective energy systems." — Strong support from central authorities using tax incentives, zoning, energy planning, building regulations, subsidies, etc.